Drain liquid from can into measuring cup & add milk to measure 1 cup. Combine drained corn with egg, stir in flour & baking powder until moistened adding additional flour if needed to make stiff batter. Melt butter in sauté pan & brown garlic. Remove garlic from butter. Dredge snails in bread crumbs, sauté until slightly golden. Serve with hot salsa or warm scampi sauce. Arrange 1 C of spinach on a plate in a nest. Heat margarine, salt & pepper in a pan, sauté snails & almonds until lightly browned. Drain & put 1 tsp. of almonds in each nest. Heat butter in large saucepan. Sauté garlic, shallots, parsley & mushrooms for 5 minutes. Stir in snails & wine; cover & simmer for 10 minutes. Stir in cream & flour until smooth; simmer until thickened. Season to taste with salt, pepper & nutmeg. Spoon over individual baguettes. 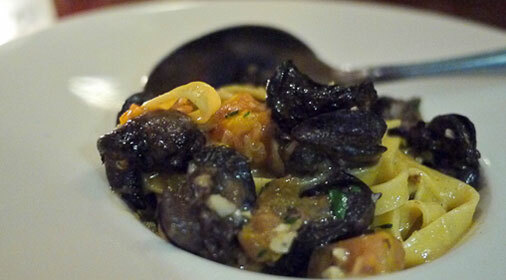 In a saucepan, simmer snails & shallots in ¾ cup wine 10 minutes. Remove from heat. In a large saucepan, melt butter & sauté artichokes, onions & garlic until onions are clear. Add oregano & cayenne pepper while cooking. Add lemon juice & cook 2 minutes, stirring. Add fish stock, milk, & ¼ cup wine. Simmer 2 minutes. Stir in cream, bring to just boiling. Remove from heat; add snails & wine mixture. MAKE AHEAD: The recipe can be prepared through Step 3 and refrigerated for up to 2 days. As evening falls, the Jamâa El F'na square fills with snake charmers, fortune tellers and food vendors who sell boubouches, a delicious snail soup. Bread discs to line for extended plating.